December 03, 2018 at 3:26 pm. Saturday afternoon, we saw UCF freshman quarterback Darriel Mack grow into his role as a college football quarterback within its 56-41 win over Memphis for the AAC championship. For the first quarter and a half, it looked dicey as he lost fumbles on two of the Knights’ first three drives. One resulted in Darrell Henderson’s second touchdown of the afternoon and the other resulted in a 70-yard touchdown run by Patrick Taylor which gave the Tigers a 21-7 lead with 8:22 left before halftime. 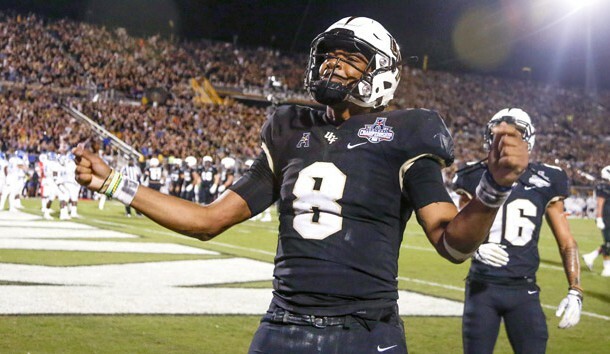 Once Mack settled down and got his feet under him, he relaxed and became confident and then the UCF offense started to perk – so well in fact that he scored four touchdowns on the ground and threw for two more. UCF scored every time it had the ball in the second half in dispatching the Memphis Tigers for the fourth time in the last two seasons. Mack finished by completing 19-of 27 passes for 348 yards and rushing for 59 yards on 18 carries with those four rushing touchdowns. Mack rebounded well throughout the second quarter, but he hit Memphis with the game changer right out of halftime when he hit wide receiver Otis Anderson on a 54-yard touchdown pass which cut the Tigers’ lead to 38-28. That was the confidence booster he needed as he engineered four eight-play touchdown drives behind those where he scored on each of those. Mack’s resiliency inside of leading UCF to the championship defined the resiliency of this team all season as they found ways to win. Two of those against Memphis as they trailed the Tigers by 16 in Memphis before pulling out a 31-30 victory. The Knights came into the game with only nine turnovers on the season and loss three fumbles in the first half. Once again, it spoke to their ability of the Knights to stare down the face of adversity. Another Kind of Mack Attack – Greg McRae Carried the ball 24 times for 206 yards and was the complement to Mack’s passing game heroics as wide receivers Gabriel Davis (101) and Dredrick Snelson (120) went over 100 yards in catches. McRae put the Tigers on notice late in the third quarter when Heupel decided to go for it on 4th-and-1 from the Memphis 49. He went off the right side for 47 yards which set up Mack’s two yard run and gave UCF it’s first lead at 42-41 with 14:28 to play in the game. Tiger Tale: There was Darrell Henderson right, Darrell Henderson left, Darrell Henderson up the middle and oh yeah, a late second quarter touchdown pass by Darrell Henderson. He was nothing short of tremendous with 207 yards on 10 carries and touchdown runs of 82, 60, and 12 yards in the first half as Memphis led 38-21 at halftime. It seemed Henderson could get to the end whenever he wanted to. In the second half, he only had six carries for three yards which was really quizzical. Heupel talked about how Memphis and Henderson were able to pile up so many yards on the ground in the first half. “We had guys that didn’t have gap integrity in the first half,” the first-year UCF Knights coach explained, “I thought our ‘backers weren’t shaded enough so some of the combinations were able to seal off the linebacker on the second level, create some big plays. UCF converted 8-of-13 third downs while Memphis was good for only 6-of-15. The Tigers still rushed for 401 yards and controlled the line of scrimmage. Patrick Taylor joined Henderson in going over 100 yards as he had 118 yards on 15 carries.